The Lincoln Memorial in Washington, D.C, a Neoclassical monument to the late US President. The Flatiron Building, an 22 story early skyscraper in New York City which is easily recognized for it’s narrow triangular shape. Some photos of the Flatiron Building from my trip to NYC this June. 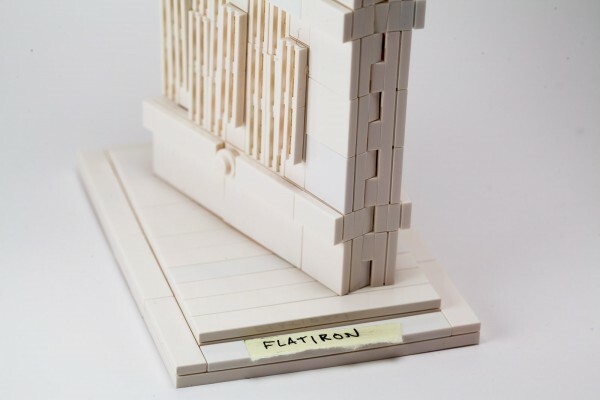 I spent about an hour this evening reverse-engineering the flatiron building to see what we should expect, based only on the one blurry low-resolution photo I could find. Several people have critiqued the color choice, which appears to rely on “tan” and “dark tan”. I think it’s a totally reasonable color choice given the relatively limited palette of LEGO colors. Others have concerns that the model is overly simplistic, but so far I think it will be an average set in the overall series; not the best, but not the worst either. 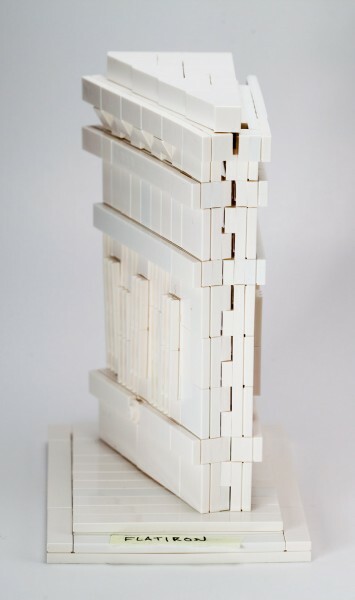 My crude LEGO Flatiron re-creation. Naturally, a wedge-shaped building requires some clever construction. LEGO isn’t really well suited to this shape. It looks like they decided to build the three faces of the building using SNOT (Studs not on top) technique. In practice, it means that the building is comprised of 3 flat panel modules which will likely be built flat, then stood on their side during final assembly. The original building has rounded corners, and this is recreated using the new 2×1 (11477) and 2×2 (15068)sloped curves which were introduced in 2013 and 2014 respectively. (These suggest new colors: 2×1 hasn’t been offered in either color, and 2×2 doesn’t exist in tan.) Sadly, I don’t have *any* of either part, so I just used a 1×2 tile with a 1×1 plate under one side as a crude approximation. Even the top employs SNOT techniques. The top looks like it will use 4x 60481 – “Slope 65 2 x 1 x 2” to cover up the triangular-shaped void between the three walls. The side “zippers” together cleverly. 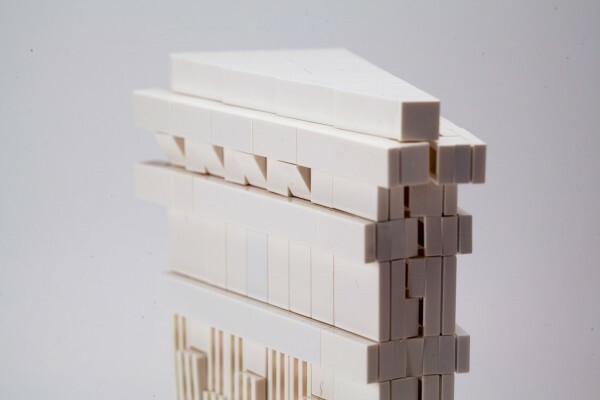 A sticky note gives this the refinement of any other official LEGO “Architecture” set. If I were to guess based on my brief analysis, I would expect this will be around 375 pieces and priced 29.99$. This puts it in the same category as Big Ben or The Eiffel Tower. Previous story Minor changes in latest 21050 – “Architecture Studio” set. And what’s coincidental – or perhaps timed very well – is that LEGO is opening its flagship NYC store right across from the Flatiron Building this fall! 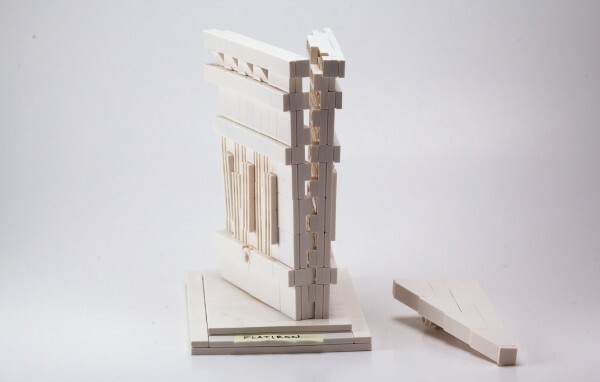 @Jeff, that doesn’t feel like a coincidence to me… In fact, it supports my theory that LEGO Architecture sets sell extremely well as a tourist gift while visiting the attraction. It looked like they were doing some restoration work on Flatiron building in July, I wonder if it will be complete for around the same time as the new LEGO store and the release of the new set. Did you check your building with the LEGO 3D Catalog App ? @Stephane, not yet… I’m going to wait for the official set to see how close my model came to the real thing. Is there a way to close the gap in the front of the building? I have tried “messaging” it into place, but it doesn’t quite finish it. Also, the rear view of the rooftop is not pleasing. I wonder if I am missing a part. I’ve seen no rear views of the kit. Thanks.